Farmgirl Fare: Thursday Dose of Cute: Score Six for the Mole Patrol! Thursday Dose of Cute: Score Six for the Mole Patrol! 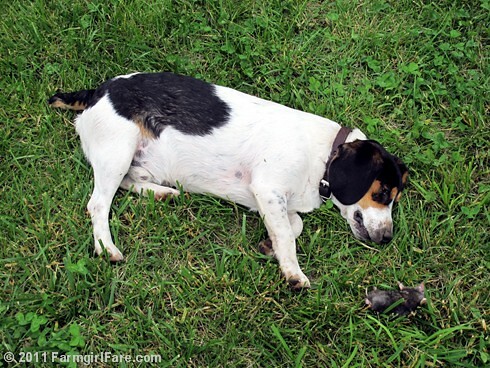 When we adopted beagle pup Bert back in late December, he came to us with the assurance that he was an accomplished mole catcher, which is just what we wanted to hear. Right from the start he was an enthusiastic member of the Mole Patrol, intently digging for hours all around the farm and encouraging others to do the same. But after a while (like several months), it appeared that although Bert did a whole lot of mole hunting, he never seemed to do any actual mole catching. It was getting to the point where the dog damage was becoming worse than the mole damage. Over the last couple of months, I've found six dead moles in the vicinity of various excavation sites. I'm not generally one to celebrate the demise of little critters, but moles—who are capable of tunneling up to 160 feet in a single night—do a tremendous amount of damage in the garden and around the farm. And while I haven't actually seen Bert catch any of the moles, I'm giving him the hard working benefit of the doubt. Now if only somebody around here liked to eat them. Apparently dogs, cats, and chickens all think moles taste terrible. Want to see more of the Mole Patrol? 2/22/11: Donkeys on the Mole Patrol, Too? 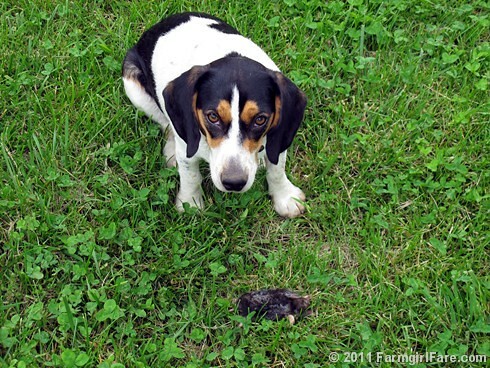 © FarmgirlFare.com, home of the happy and helpful dogs—and I still want a TEAM BEAGLE t-shirt. If I die and come back as a dog, I want to end up on your farm! What a fantastic doggie life. Go, Bert! Your dogs have the same goofy look on their faces as our dog, Kelly, gets. Makes you wonder what they're really thinking. Good dogs! Now, if you want a swimming pool, just point to the ground and yell, "MOLE!" They will have it dug in no time at all! Go Bert! Those moles look nasty! Do you wanna loan him out? Just lovin' that dirty nose and tongue -- proof of a job well done! I'm also happy any time I get a chance to see Buddy Bear -- I do so love him.